Known as ‘Das Tierbuch des Petrus Candidus‘ (Animal Book), this 1460 Vatican Library Manuscript by the Italian humanist, Pier Candido Decembrio, continues the tradition of early natural history books in the manner of Pliny the Elder, the Physiologus and Thomas of Cantimpré which served as Candido’s sources. Commissioned by Ludovico Gonzaga, Marquis of Mantua, ‘Das Tierbuch’ describes all known real and mythical animals, but the wonderful illustrations were a 16th century addition to the manuscript. 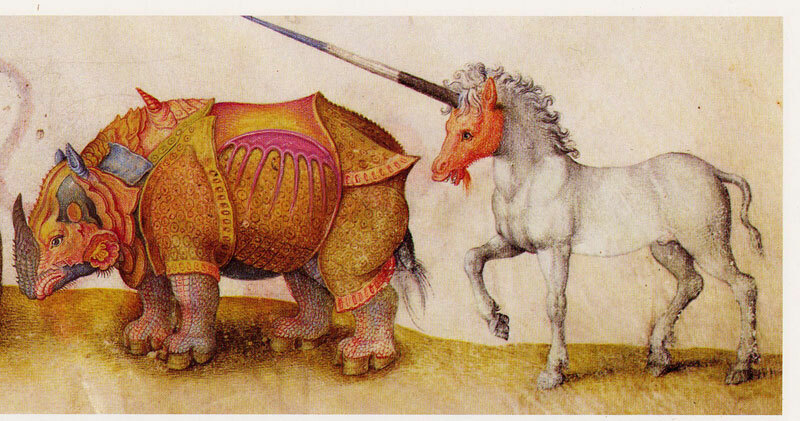 One way we know this is because the rhinoceros drawing is an exact copy of Albrecht Dürer’s famous 1515 stylised depiction of the animal. This colourful images above comes from Austria’s University of Salzburg Book of the Month series where other interesting creatures can be found. Their illustrations were scanned from a 1984 reprint of ‘Das Tierbuch des Petrus Candidus’.